Resource Center Luxury Rehab vs. Regular Rehab: Is It Worth It? Luxury Rehab vs. Regular Rehab: Is It Worth It? Anyone can struggle with addiction. The National Institute on Drug Abuse (NIDA) states in their Principles of Drug Addiction Treatment that this complex, chronic, and treatable disease of the brain requires a variety of treatment options. Aside from the evidence-based foundation of addiction treatment – medically supervised detox and therapy through a rehabilitation program – the structure of personalized rehabilitation can take several forms. Is Luxury Rehab More Effective in Curbing Addiction? 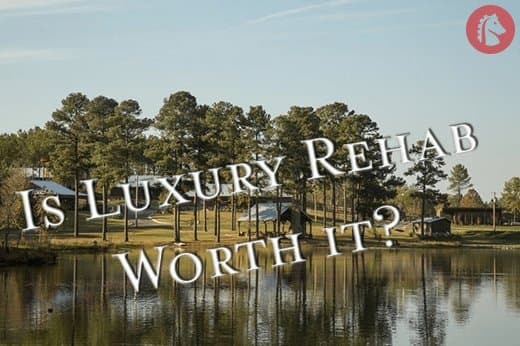 Will Luxury Drug Rehab Be Covered by Your Insurance? Some people do very well in simple outpatient rehabilitation, with group therapy taking up fewer than 10 hours of their week; other people need long-term, inpatient treatment to remove them from their environment and help them physically stabilize. Some people need a calm, remote location while others can continue to live at home. 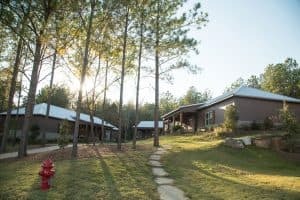 While many people benefit from the most basic form of drug rehabilitation and recovery, others can have more success by staying at a luxury rehabilitation facility. These programs come with higher price tags, but luxury rehab facilities offer dozens of amenities, beautiful locations, and leading medical experts that standard rehab programs often do not offer. When seeking evidence-based treatment and recovery options, there are some standards to look for that all treatment options should incorporate. These are based in medical research and have been shown to work for most people. Drug detox services should involve medical specialists, including physicians or nurses. The withdrawal process can occur in a hospital setting, where a doctor monitors the person’s vital signs and administers medical treatment to manage health issues as needed. For many rehabilitation programs, ending physical dependence on a substance is a prerequisite for entering the therapeutic part of treatment. Exceptions include medication-assisted treatment (MAT) for opioid addiction, which may involve long-term maintenance drugs like buprenorphine or methadone. Some people can safely detox in an outpatient setting while others require full supervision. For withdrawal from benzodiazepines, alcohol, and opioids, medical detox is always required. Once the individual enters treatment, they must have access to addiction specialists. This requires appropriate state licenses and degrees from accredited universities or colleges at a minimum. For many rehabilitation facilities, additional certification through nonprofit regulatory agencies, like the Commission on Accreditation of Rehabilitation Facilities International (CARF), shows that the treatment program is serious about providing the highest quality of care possible. Psychiatric treatment, involving at least group therapy, and often individual and family therapy, is necessary to understanding the core causes of addiction and changing the individual’s behaviors around substances. This begins with a psychiatric assessment, uncovering potential co-occurring mental health conditions, and developing a treatment plan. This plan should be updated consistently as the person goes through the treatment process. Relapse prevention education can be part of group therapy, individual therapy, or a separate program. As a chronic illness, addiction involves relapse as a symptom. Between 40 percent and 60 percent of people who go through detox and rehabilitation relapse back into substance abuse. These rates are similar to those associated with other chronic illnesses, including type I diabetes, which has relapse rates of 30-50 percent, or hypertension, which has relapse rates of 50-70 percent. Relapse, in the context of chronic illness, simply means that symptoms of the illness reappear, and require the individual to return to treatment and possibly develop a new treatment plan. However, learning about relapse, and understanding how to approach the experience, is an essential part of addiction treatment. With the exception of required prescription medications, rehabilitation programs are abstinence-only environments. If a person requires prescription drugs, like antidepressants or MAT, then finding a rehabilitation program that specializes in these treatments is best. However, a safe environment without access to drugs or alcohol is the first step to changing behaviors around intoxicating substances. If a person cannot safely remain drug-free in an outpatient program, it is important to have access to inpatient treatment. Referrals to long-term recovery options, including individual therapy, case management, and support groups, are not required, but they are very helpful. Getting social support to stay sober is very important. These are the basic aspects of any treatment program, whether outpatient or inpatient. Many rehabilitation programs provide these at various levels, which may involve various costs. For example, inpatient treatment will be more expensive than outpatient treatment because of the cost of housing and feeding people living on the premises. Generally, luxury rehabilitation costs much more than standard outpatient or inpatient treatment. However, for those who need a holistic approach, complementary treatments, or greater emotional support during their recovery, luxury rehab can offer these options in a serene setting with high-quality staff. For those who need a holistic approach, complementary treatments, or greater emotional support during their recovery, luxury rehab can offer these options in a serene setting with high-quality staff. Luxury rehab facilities are often stereotyped as an expensive vacation. Many of them are located in beautiful landscapes, like mountain retreats or beach resorts, giving the impression that a person entering this kind of treatment does not get help but simply relaxes for three months and then returns to their original life. Just because a program is nestled in a beautiful location, with perks that cost more than other forms of treatment, does not mean a person entering this type of program does not get help. Rehabilitation program standards are still upheld, especially behavioral therapy and MAT. However, luxury rehab is more likely to offer complementary or holistic treatment options on top of the existing evidence-based treatment. For many people, these additional forms of therapy can help to focus the mind, heal the body, and create new behavioral patterns that will reduce the risk of relapse. The National Center for Complementary and Integrative Health (NCCIH) defines complementary and alternative medicine (CAM) as a group of diverse health practices, systems, and products that are not considered part of conventional medicine. While there are few specific, scientific studies showing that CAM works when compared to conventional medicine, for many people, the personal, emotional benefits of additional exercise, dietary changes, routine changes, and healing practices can support the important conventional, evidence-based approaches of detox, therapy, and MAT. Luxury rehabilitation is more likely to offer these options compared to standard rehabilitation. Offering amenities like these and more may also help retention rates. NIDA recommends that post-detox therapeutic treatment last at least 90 days, or three months, but keeping people in treatment for that length of time is difficult. On average, between 30 percent and 60 percent of people who enter rehabilitation programs remain there for a full course of treatment. For many, insurance does not cover treatment beyond one month. For others, they feel that they are “better” and do not need to finish treatment. Still others do not feel they are receiving any benefit from treatment at all. Providing additional social and emotional support to continue the recovery process, in a comfortable environment, can help some people get the full course of treatment they need. Luxury rehabilitation is a great option to keep retention rates high while providing quality, evidence-based treatment.